Years ago, you might put your hands in your pockets and jingle a few coins piled there, or dig around in your purse for some spare change. Today, you pay with a credit or debit card or an app on your phone. Fewer people are carrying cash and change, and parking meters are starting to adapt — or disappear entirely. The average business owner might not think twice about the on-street parking in front of his or her building. 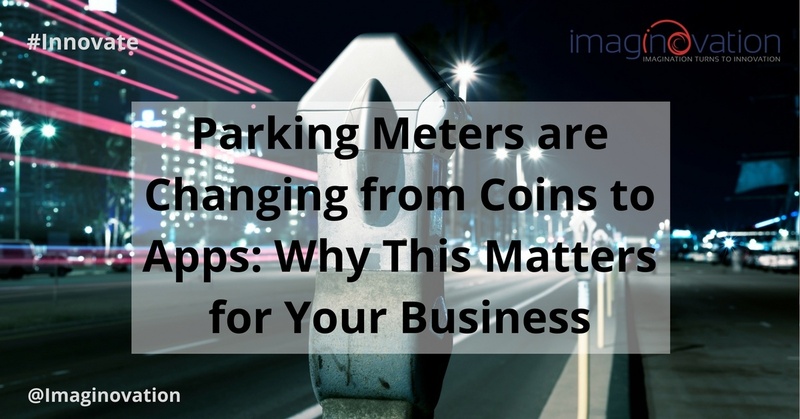 But the parking meter is just one example of how technology changes can affect a business and why you should be taking note. The world’s first parking meter was installed in Oklahoma City, Okla. in 1935. Then called Park-O-Meters, they were established for the same reason they are still used today: to regulate parking and encourage turnover in areas where there are more cars than spaces. Business owners realized the value in turnover; today, millions of parking meters line city streets. While some saw their value, certainly parking meters have had their critics, from automobile associations to people who don’t want to pay to rent the real estate from the city. However, technology continues to evolve the way we do many things, and how we pay for parking is just one more example. While many of today’s meters still accept coins, most can accept credit cards as well. Now, more people are paying by app instead. Parking meters apps give people the opportunity to extend their time remotely, saving them the cost of a ticket. Parking is a struggle faced by city leaders across the U.S. In the age of smart cities and the Internet of Things (IoT), parking naturally becomes one of the first to see the benefits of these changes. For example, in some cities, nearby cameras with a view or sensors embedded in the ground can determine whether the parking spaces are occupied or available and send that information to a real-time parking map. This makes it easier for people to find available parking, cutting down on those circling blocks in search of a space. City leaders can also study the map and use the data to make decisions about parking rates, perhaps changing them by the hour based on supply and demand. Meanwhile, parking enforcement teams can see violations using the map. They might even focus on those whose parking is causing a problem, such as people parking in wheelchair accessible spaces or those in red zones. Some cities are testing new programs that ditch parking meters altogether, relying on smartphone apps in which you enter your space number and pay. Another city is testing a meter inside your car that clocks your parking location and time and charges accordingly — sort of like your EZ pass for toll roads. But what else can technology do for parking? One IoT writer suggests merchants can choose to pay for a person’s extra 15 minutes. The driver receives notification that the merchant did so, and is happier and more likely to return. The merchant benefits by basically getting an advertisement out of the deal. That’s just parking meters, which manage on-street parking. Parking decks, known as off-street parking, are another area in which IoT is making things easier. Sensors and apps in parking garages/decks could also tie into real-time parking maps as well as lights in front of the deck indicating the number of available spaces as it changes. As driverless cars come online, decks will be designed for self-parking cars. These take up 60 percent less space than a normal lot and ease congestion as drivers are dropped off at their location, and the car takes itself to a parking area. Retail businesses with city storefronts certainly care about parking and have a vested interest in strong turnover. However, all businesses must be thinking about technology changes and what it might mean for their industries. The manufacturers of parking meters changed their meters, but when cities stop buying meters in favor of apps, what will they do? Are they now working to get into the parking app business? There are opportunities for tech improvements and innovations within every industry — even the parking meter. How can your company use changes in smart cities and IoT to promote its own growth? History of full of examples of companies who failed to adapt, including those who failed to recognize how technology would change their industry such as Blockbuster and Borders. Contact us if you’re looking for ways technology can keep you out of the recycling bin.